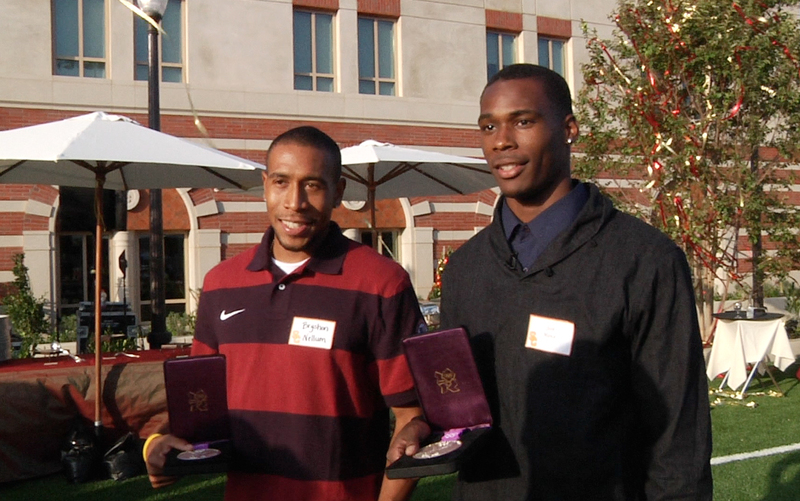 Fresh off the heels of winning medals at the 2012 London Olympics, USC student athletes Bryshon Nellum, left, and Josh Mance join the Trojan community at the opening of the John McKay Center. USC athletes have a new home on campus. The John McKay Center, a 110,000-square-foot building aimed at helping scholar-athletes of the university’s 21 sports, opened with a dedication ceremony attended by generations of supporters of USC Athletics on Aug. 21. The two-story (plus basement) building houses state-of-the-art training facilities, classrooms, offices for coaches, men’s and women’s locker rooms, weight rooms, and even an indoor football field. The center adds significant new space dedicated to training and educating student athletes. The weight room facilities alone have tripled in size from 9,600 square feet to 32,000 square feet, and the athletic training room in the new building encompasses 18,000 square feet — more than six times the size of Heritage Hall’s 2,700-square-foot training room. The new building also houses The Stevens Academic Center, which features tutoring, counseling, computer labs and study space for USC athletes. USC sophomore Josh Mance, a silver medalist at the London Olympics, is looking forward to using the new facilities as the academic year opens. Olympic silver medalist (and closing ceremony flag bearer) Bryshon Nellum, returning to USC for his senior year, echoed Mance’s enthusiasm. The John McKay Center is named in honor of USC’s most successful football coach, the legendary John McKay, who won four national championships at USC before becoming the first head coach of the NFL’s Tampa Bay Buccaneers. Heritage Hall, the historic athletics building, is slated to undergo renovation this academic year and is supported by the Heritage Initiative, the ambitious $300 million fundraising drive that is part of the $6 billion Campaign for the University of Southern California.